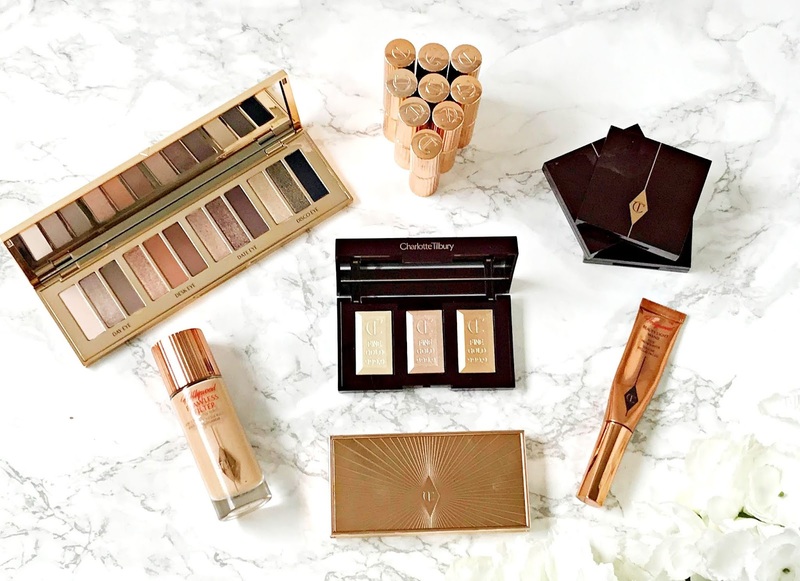 I'm a highlighter addict and a huge fan of Charlotte Tilbury makeup (see Brand Focus post here) so it was inevitable that I would buy her newly released Bar Of Gold Palette. I've used all of her other highlighters: Filmstar Bronze & Glow, Hollywood Beauty Light Wand and Flawless Filter but every year when she released the individual limited edition Bar Of Gold, I somehow missed out. Therefore, I went into this purchase without any knowledge of whether that shade and formula would suit my skin but given that I love all of her other highlighters, I thought it wasn't too much of a risk. 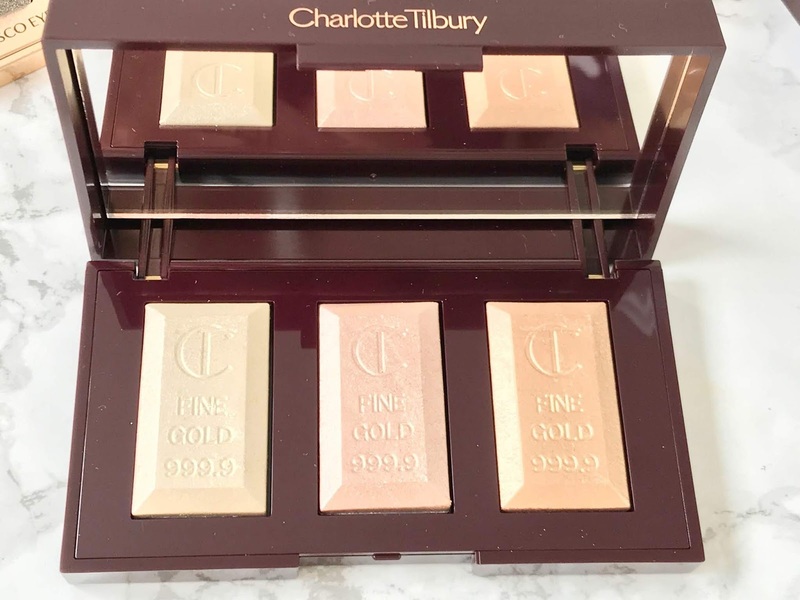 The individual Bar Of Gold was priced at £32 and this palette is priced at £49 so it's good value in the world of Charlotte Tilbury makeup but in terms of makeup in general, it's quite pricey given that each bar only contains 2.5g of product so that's 7.5g for £49. That being said, it will take a long time to hit pan on even one of these bars, never mind all three! The packaging, as always, is stunning. A strurdy, heavy plastic case in the traditional burgundy shade with rose gold accents. Inside the lid is a decent sized mirror and then the three highlighters with good spacing between them so the shades won't necessarily overlap. 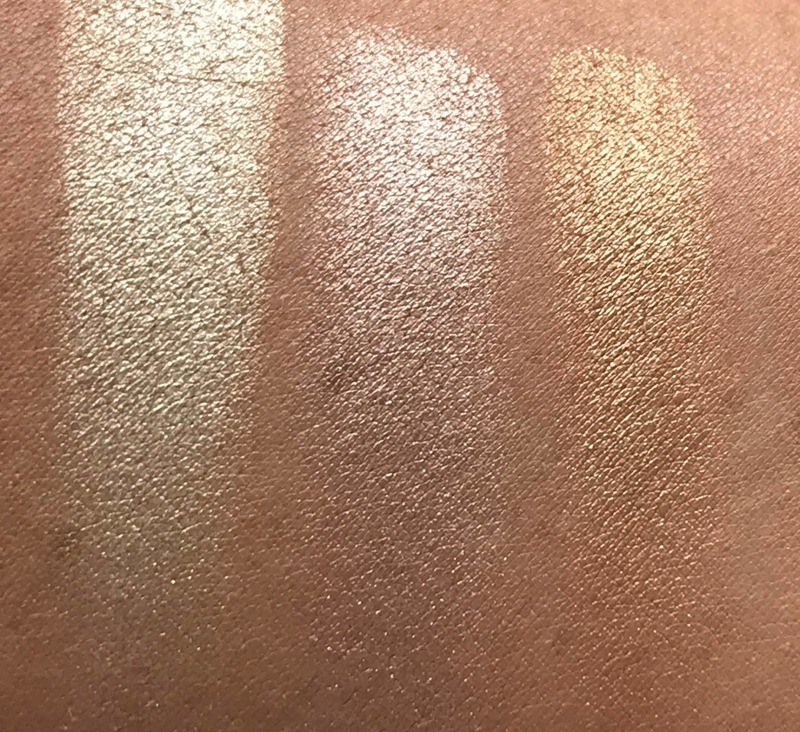 On the left is the original Bar Of Gold shade, in the middle is a new rose gold shade and on the right is another new shade, which is bronzey gold. The texture of the powders is beautiful - soft to touch and it melts into the skin - it's actually very similar to the Pixi highlighters, which I reviewed here. My worry with all highlighters is that they will worsen the look of textured, porous or lined skin but these powders are not guilty of that. The original gold shade is ideal for highlighting and the middle rose gold can be used as a traditional highlighter or as a blush topper and the third shade can be used as a highlighter, eye shadow or as a bronzer - depending on your skin tone. These highlighters are a dream to use - they really do melt into the skin and can be built from an everyday subtle highlight to a 'seen from outer space but not discoball' highlight. I also find that they are long-lasting on the skin and are still visible when I'm removing my makeup in the evening. Like the highlighter in the Filmstar Bronze & Glow palette, these powders do not settle in fine lines and I think that if you are concerned that some highlighters exacerbate your fine lines and actually age your skin, then you will really appreciate the formula of these highlighters and even at £49, this palette would be well worth the investment. I think that everybody, no matter what their age, would appreciate this palette - it's just a matter of budget and what you think is an acceptable price to pay - you could base that on your own budget and also on cost per wear because this palette will last a verrrrrrry long time! Have you bought the Bar Of Gold Palette or are you tempted to? I'd love to hear your thoughts! Available from Charlotte Tilbury now at £49.